We’re finally feeling that crisp chill of fall here in Maine. We’re at that point in the year where we sweat our butts of during the day and can’t find enough blankets to keep us warm at night. But the bipolar weather is one of my favorite things about fall! 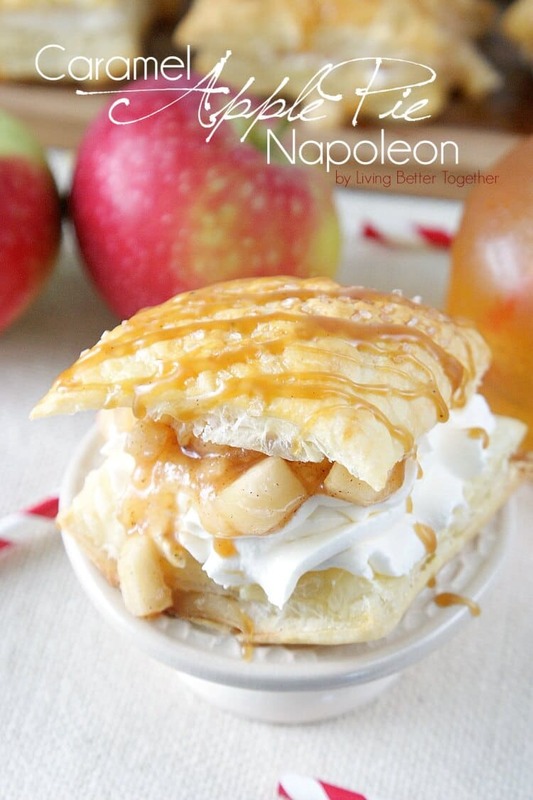 And the apple recipes just keep on coming, today I’m sharing this simple and delicious recipe for Caramel Apple Pie Napoleons! Have you ever had a napoleon? I still remember my first, it was a blueberry one from a little cafe and I was completely in love with the flaky pastry filled with a delicious cream and sweet gooey blueberry goodness! That was years ago and I figured it was time to make some of my own. 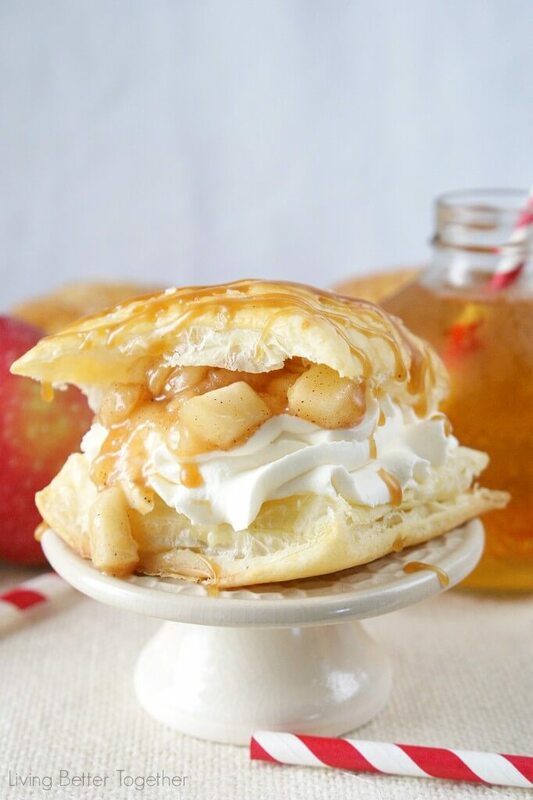 With the help of frozen pastry dough, these Caramel Apple Pie Napoleons are so easy to make and super quick so they’re perfect if you don’t have a lot of time! My Caramel Apple Pie Dip has been really popular since I shared it last week and I thought it could be used for so much more than just dip! The spice and apples of the dip would pair perfectly with a fluffy sweet mascarpone cream filling sandwiched between two layers of delicate pastry. Drizzle all that with gooey caramel and it’s LOVE! A simple and delicious pastry made with the flavors of the season! Cut thawed pastry sheet into 9 even squares. Place evenly apart on a parchment lined baking sheet. In a small bowl, wisk together egg and water to make egg wash.
Brush egg wash over the pastry dough. Bake for about 10 minutes until dough is puffed up and golden. Then prepare cream filling by beating heavy cream, mascarpone, confectioners' sugar, and vanilla pudding mix together until still and fluffy. Once pastries have cooled, gently pull apart the tops and bottoms of them. Pipe cream onto the bottom half of each pastry. 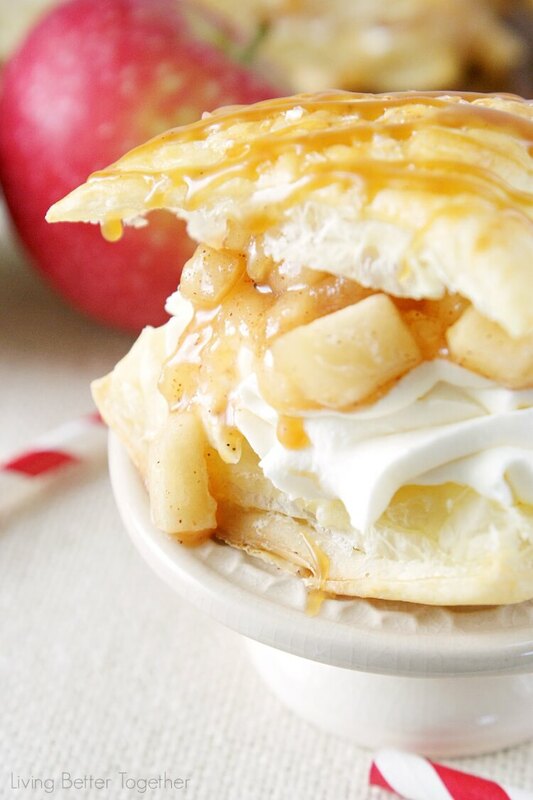 Spoon Caramel Apple Pie Dip onto each cream topped pastry. Place the top half of the pastry on top of the cream and dip. Drizzle the top of each napoleon with caramel sauce. Caramel apple is one of my favorite fall combinations! These look so good! I have a soft spot for napoleons. These look amazingly delicious! Oh they were, napoleons are so easy to make which makes me love them even more! Totally loving how delicious, quick and simple this recipe is! 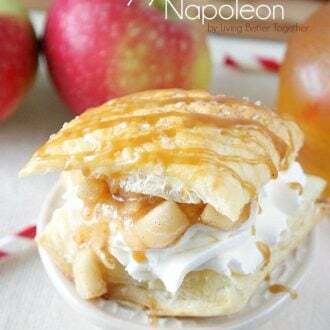 I love napoleon’s but have never had an apple pie flavoured one before.. need to recreate the recipe asap! Oh it’s so good, I’ve always had them with brighter summer fruits, but the fall flavor sure doesn’t disappoint! Enjoy! I feel as though I’m missing something — where does the mascarpone go? It goes in with the filling ingredients, I must have missed it, thanks for pointing it out!